An annual visual check and action on potential weak spots, coupled with a 5-7 year cycle of re-painting, will be sufficient to protect your timber windows for many years. The oldest windows I worked on were installed in the 1700s. They were ‘tired’ but because they had been included in a maintenance programme over the centuries (the windows were part of a church estate), they were in remarkably good condition. As a matter of course I measure the moisture content of your windows, starting at the cill and moving up every 6” until I get a reading of between 12 and 18 percent. This will give me the information I need to asses the extent of potential wet rot areas. On average no more than 10% of any given window will be rotten, including the cill. Repair rather than replacement will be economically viable in all but the most exceptional cases of damaged of frames and openers. Of all the windows in a year that I assess, I see perhaps five percent that are beyond economical repair. In these few cases, it is cheaper for me to manufacture and fit like-for-like wooden replacements. Essentially, it’s a fungal attack on timber that has high moisture content for an extended period of time. There are two main types: white and brown, with several less common types also in existence. You can easily identify both white wet rot and brown wet rot. The former has the appearance of fine threads and often a soft white tissue structure. This type is usually found between openers and cills or transoms. Brown rot appears as cracked cube structures, often brown and brittle, found on exposed timber and joints. Of the two, white rot is probably more destructive as sometimes the fine hairs can travel onto masonry. 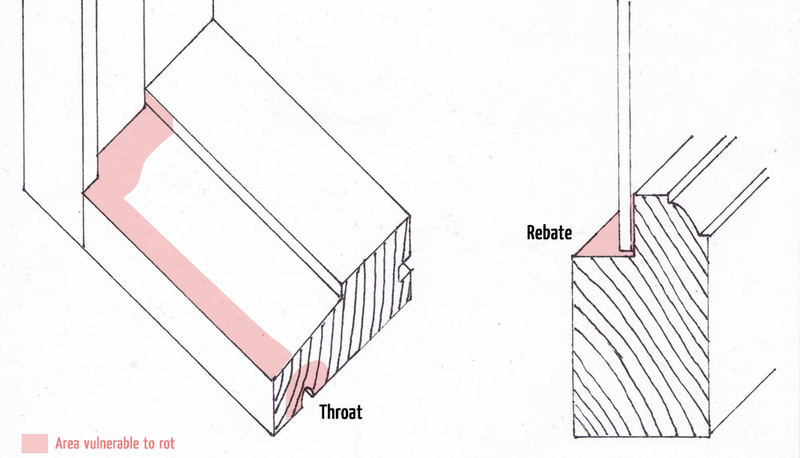 Treatment is the same for both: cut it out and replace the affected area with new timber. If the spores from white rot have penetrated the brick this will need to be treated with an appropriate chemical solution. Window glossary: Here you can see the common terms used when describing windows.